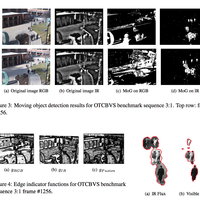 71 Publications by "G. Seetharaman"
Multi-object tracking is one of the most challenging problem among computer vision applications due to computational cost, partial or full occlusions, crowded scenes, and etc. It has many real-life applicable uses from surveillance to video analysis and video summarization. In this paper, we propose a hybrid tracking-by-detection system that combines local and global data association scheme to ensure efficiency and reduce complexity. In local data association, spatial and appearance modules are used to ensure first step assignment for the strongest object matching. Then tracklet linking is applied during global data association step after filtering out all unreliable and distractor hypotheses using spatial, temporal and appearance descriptors. Our framework can handle the appearance of new objects, temporal disappearance, object terminations, and object occlusions. Our experiments on MOT16 dataset consisting of challenging real-world videos show the integration between local and global data association is important and having promising performance. N. M. Al-Shakarji, F. Bunyak, G. Seetharaman, and K. Palaniappan. 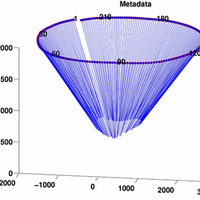 A hybrid local and global multi-object tracking with semantic spatial and appearance modules. International Society for Optics and Photonics  , volume 10645, pages 106450B, April 2018. We describe the challenges and capabilities of implementing a fast, efficient georegistration system on low-power embedded systems. The input to this are 2-D images and refined camera metadata sensor measurements, the output are registered aerial images that can be used in image tracking and 3D reconstruction. We propose future application in real-time on-device processing, given initial speeds on embedded systems. Because the method used doesn’t rely on image-to-image feature correspondences as in other methods, the computation is significantly faster and improved upon further by GPU programming. E. Teters, H. AliAkbarpour, G. Seetharaman, and K. Palaniappan. Real-time geoprojection and stabilization on airborne GPU-enabled embedded systems. SPIE Geospatial Informatics, and Motion Imagery Analytics VIII, volume 10645, pages 106450H, April 2018.
aerial imagery, mosaicking, registration, summarization, feature based registration. In this study, we devise a method for summarizing geospatial content of aerial imagery using mosaicking. 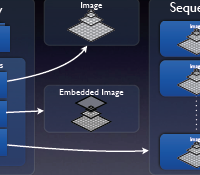 Mosaicking has been a popular method for combining large sequence of image information and providing a wide field of view in computer vision. We propose a feature-based registration method which brings the complexity and homogeneity nature of maize data under consideration and formulates a two-step registration method which reduces error accumulation acquired through traditional frame-to-frame registration. Experimental result shows good quality mosaic generation without any metadata information available for long sequence of aerial video. 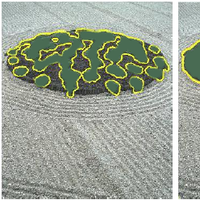 This geospatial summarization of crop field data can be helpful for phenotypic analysis, monitoring of field, checking movement and growth of plants, change in field dynamics, etc. R. Aktar, H. AliAkbarpour, F. Bunyak, T. Kazic, G. Seetharaman, and K. Palaniappan. 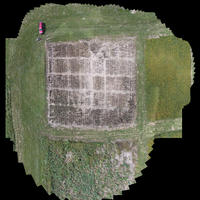 Geospatial content summarization of UAV aerial imagery using mosaicking. International Society for Optics and Photonics, Geospatial Informatics, Motion Imagery, and Network Analytics VIII, volume 10645, pages 106450I, April 2018. Local feature matching has been proven to be successful for computer vision tasks such as Structure-from-Motion (SfM) and 3D reconstruction. Reliability of features in terms of being precisely detected and persistently matched along a sequence can have a great impact on the quality of the SfM and even on its convergence. Since many feature detectors and descriptors are exclusively designed for specific applications, it is important to find a feature detector-descriptor combination that performs well for SfM. In this paper we evaluate the quality of different image features such as FAST, SIFT, SURF, and BRISK and their effects on the Structure-from-Motion performance. To do this end, we design and perform two evaluation procedures to assess a feature matching result on a wide area motion imagery dataset. A matching result is represented in the form of feature track and a track is a collection of continuously matched feature points along the sequence. First we use the concept of Epipolar geometry to measure errors in each correspondence (matching pair). The distance from a matched feature point to the corresponding epipolar line is measured as the error metric. Second, we compute an optimized metadata from SfM using feature matching tracks and then compare it with the ground truth metadata for evaluation. 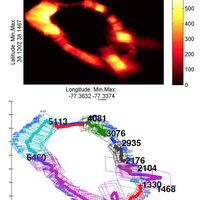 Experimental results demonstrate that SURF detector combined with SURF descriptor generates the longest feature tracks while FAST detector plus SIFT descriptor produces the highest matching precision. K. Gao, H. AliAkbarpour, K. Palaniappan, and G. Seetharaman. Evaluation of feature matching in aerial imagery for structure-from motion and bundle adjustment. International Society for Optics and Photonics, Geospatial Informatics, Motion Imagery, and Network Analytics VIII, volume 10645, pages 106450J, April 2018.
image color analysis, tracking, color, correlation, lighting, histograms. 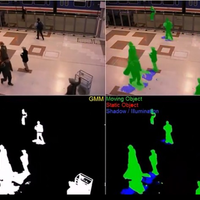 Multi-object tracking is an important computer vision task with wide variety of real-life applications from surveillance and monitoring to biomedical video analysis. Multi-object tracking is a challenging problem due to complications such as partial or full occlusions, factors affecting object appearance, object interaction dynamics, etc. and computational cost. In this paper, we propose a detection-based multi-object tracking system that uses a two-step data association scheme to ensure time efficiency while preserving tracking accuracy; a robust but discriminative object appearance model that compares object color attributes using a novel color correlation cost matrix; and a framework that handles occlusions through prediction. Our experiments on UA-DETRAC multi-object tracking benchmark dataset consisting of challenging real-world traffic videos show promising results against state-of-the-art trackers. N. M. Al-Shakarji, F. Bunyak, G. Seetharaman, and K. Palaniappan. 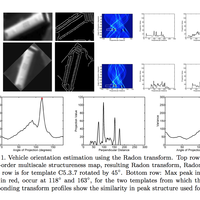 Robust multi-object tracking with semantic color correlation. IEEE International Conference on Advanced Video and Signal Based Surveillance (AVSS), October 2017. N. Al-Shakarji, F. Bunyak, G. Seetharaman, and K. Palaniappan. Robust multi-object tracking with semantic color correlation. IEEE AVSS International Workshop on Traffic and Street Surveillance for Safety and Security (IWT4S), August 2017. 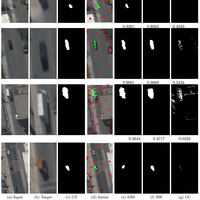 Persistent detection and tracking of moving vehicles in airborne imagery provide indispensable information for many traffic surveillance applications including traffic monitoring and management, navigation systems, activity recognition and event detection. 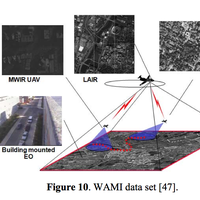 This paper presents a col- laborative Spatial Pyramid Context-aware detection and Tracking system (SPCT) for moving vehicles in dense ur- ban aerial imagery. The proposed system is composed of one master tracker that usually relies on visual object fea- tures and two auxiliary trackers based on object temporal motion information that will be called dynamically to assist master tracker. SPCT utilizes image spatial context at dif- ferent level to make the video tracking system resistant to occlusion, background noise and improve target localiza- tion accuracy. We chose a pre-selected seven-channel com- plementary features including RGB color, intensity and spa- tial pyramid of HoG (PHoG) and exploit integral histogram as building block to meet the demands of real-time per- formance. 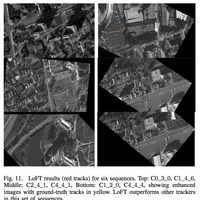 The extensive experiments on ARGUS and ABQ wide aerial video and comparison with state-of-the-art sin- gle object trackers confirm that combining complementary tracking cues in an intelligent fusion framework is essential to address the challenges of persistent tracking in low frame rate Wide Aerial Motion Imagery (WAMI). M. Poostchi, K. Palaniappan, and G. Seetharaman. 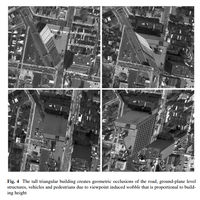 Spatial pyramid context-aware moving vehicle detection and tracking in urban aerial imagery. IEEE AVSS International Workshop on Traffic and Street Surveillance for Safety and Security (IWT4S), pages 1-6, August 2017. We describe a fast and efficient camera pose refinement and Structure from Motion (SfM) method for sequential aerial imagery with applications to georegistration and 3-D reconstruction. Inputs to the system are 2-D images combined with initial noisy camera metadata measurements, available from onboard sensors (e.g., camera, global positioning system, and inertial measurement unit). 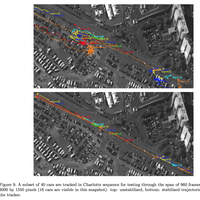 Georegistration is required to stabilize the ground-plane motion to separate camera-induced motion from object motion to support vehicle tracking in aerial imagery. In the proposed approach, we recover accurate camera pose and (sparse) 3-D structure using bundle adjustment for sequential imagery (BA4S) and then stabilize the video from the moving platform by analytically solving for the image-plane-to-ground-plane homography transformation. Using this approach, we avoid relying upon image-to-image registration, which requires estimating feature correspondences (i.e., matching) followed by warping between images (in a 2-D space) that is an error prone process for complex scenes with parallax, appearance, and illumination changes. Both our SfM (BA4S) and our analytical ground-plane georegistration method avoid the use of iterative consensus combinatorial methods like RANdom SAmple Consensus which is a core part of many published approaches. BA4S is very efficient for long sequential imagery and is more than 130 times faster than VisualSfM, 35 times faster than MavMap, and about 274 times faster than Pix4D. 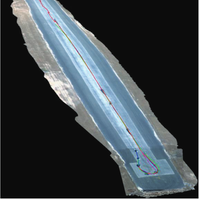 Various experimental results demonstrate the efficiency and robustness of the proposed pipeline for the refinement of camera parameters in sequential aerial imagery and georegistration. H. Aliakbarpour, K. Palaniappan, and G. Seetharaman. Parallax tolerant aerial image georegistration and efficient camera pose refinement - Without piecewise homographies. IEEE Transactions on Geoscience and Remote Sensing, volume 55, issue 8, pages 4618-4637, August 2017. This letter proposes a framework to perform 3D reconstruction using a heterogeneous sensor network, with potential use in augmented reality (AR), human behavior understanding, smart-room implementations, robotics, and many other applications. We fuse orientation measurements from inertial sensors, images from cameras and depth data from Time of Flight (ToF) sensors within a probabilistic framework in a synergistic manner to obtain robust reconstructions. A fully probabilistic method is proposed to efficiently fuse the multi-modal data of the system. H. Aliakbarpour, J. F. Ferreira, V. B. S. Prasath, K. Palaniappan, G. Seetharaman, and J. Dias. 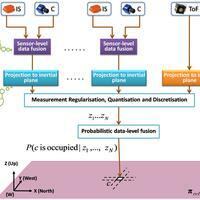 A probabilistic framework for 3D reconstruction using heterogeneous sensors. IEEE Sensors, volume 17, issue 9, pages 1-2, May 2017. UAVs in both civil and defense aviation have found numerous application areas in the last decade which resulted in sophisticated systems that extracts high level information utilizing the visual data from UAVs. Camera auto-calibration is always the first step if the intrinsic parameters of the cameras are not available. However, this process is not trivial as the aerial imagery mostly contains planar scenes which constitute a degenerate condition for conventional methods. In this paper, we propose a hybrid approach which incorporates circular point and camera position constraints as a single optimization term to automatically calibrate the camera of the UAV on planar scenes. The experimental results show that our proposed hybrid method is more robust and accurate than the conventional counterparts. keywords = "auto-calibration, planar scene reconstruction, metadata recovery, aerial imagery"
A. Akay, H. AliAkbarpour, K. Palaniappan, and G. Seetharaman. Camera Auto-calibration for Planar Aerial Imagery Supported by Camera Metadata. Applied Imagery Pattern Recognition (AIPR), April 2017.
keywords = "registration, 3d reconstruction"
Multiview learning has shown promising potential in many applications. However, most techniques are focused on either view consistency, or view diversity. 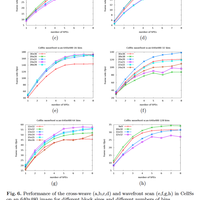 In this paper, we introduce a novel multiview boosting algorithm, called Boost.SH, that computes weak classifiers independently of each view but uses a shared weight distribution to propagate information among the multiple views to ensure consistency. To encourage diversity, we introduce randomized Boost.SH and show its convergence to the greedy Boost.SH solution in the sense of minimizing regret using the framework of adversarial multiarmed bandits. We also introduce a variant of Boost.SH that combines decisions from multiple experts for recommending views for classification. 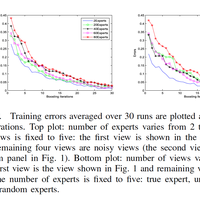 We propose an expert strategy for multiview learning based on inverse variance, which explores both consistency and diversity. Experiments on biometric recognition, document categorization, multilingual text, and yeast genomic multiview data sets demonstrate the advantage of Boost.SH (85%) compared with other boosting algorithms like AdaBoost (82%) using concatenated views and substantially better than a multiview kernel learning algorithm (74%). J. Peng, A. J. Aved, G. Seetharaman, and K. Palaniappan. Multiview Boosting With Information Propagation for Classification. IEEE Transactions on Neural Networks and Learning Systems, February 2017. S. Meena, P. Duraisamy, K. Palaniappan, and G. Seetharaman. Point based interactive image segmentation using multiquadrics splines. Proc. SPIE Conf. Pattern Recognition and Tracking XXVIII, SPIE Defense + Security, volume 10203, 2017. Most Wide Area Motion Imagery (WAMI) based trackers use motion based cueing for detecting and tracking moving objects. The results are very high false alarm rates in urban environments with tall structures due to parallax effects. 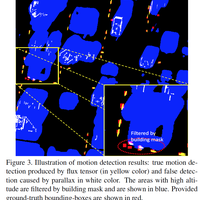 This paper proposes an accurate moving object detection method using a precise orthorectification approach for ground stabilization combined with accurate multiview depth maps for reducing the number of false positives induced by parallax effects by 90 percent. 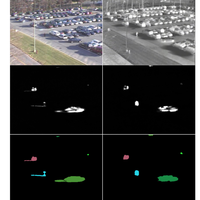 Proposed hybrid moving vehicle detection approach for large scale aerial urban imagery is based on fusion of motion detection mask obtained from median-based background subtraction and tall structures height mask provided by image depth map information. Using Building's height map, we are able to improve the object level detection accuracy in terms of F-measure by almost 57 percent from 22.2 percent to 79.2 percent. K. Palaniappan, M. Poostchi, H. Aliakbarpour, R. Viguier, J. Fraser, F. Bunyak, A. Basharat, S. Suddarth, E. Blasch, R. Rao, and G. Seetharaman. 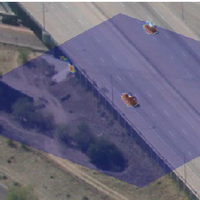 Moving object detection for vehicle tracking in wide area motion imagery using 4D filtering. Proc. IEEE International Conference on Pattern Recognition (ICPR), December 2016. Robust estimation of linear structures such as edges and junction features in digital images is an important problem. In this paper, we use an adaptive robust structure tensor (ARST) method where the local adaptation process uses spatially varying adaptive Gaussian kernel that is initialized using the total least-squares structure tensor solution. An iterative scheme is designed with size, orientation, and weights of the Gaussian kernel adaptively changed at each iteration step. Such an adaptation and continuous scale anisotropic Gaussian kernel change for local orientation estimation helps us obtain robust edge and junction features. We consider an efficient graphical processing unit (GPU) implementation which obtained 30x speed improvement over traditional central processing unit (CPU) based implementations. 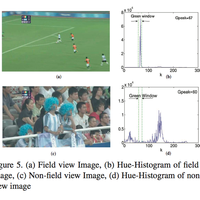 Experimental results on noisy synthetic and natural images indicate that we obtain robust edge detections and further comparison with other edge detectors shows that our approach obtains better localization and accuracy under noisy conditions. 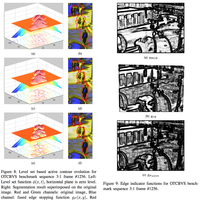 keywords = "arst, edge detection, gpu"
V. B. S. Prasath, S. Surineni, K. Gao, G. Seetharaman, and K. Palaniappan. 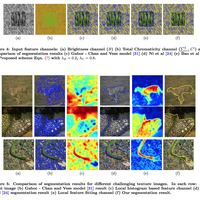 CSANG: Continuous scale anisotropic Gaussians for robust linear structure extraction. Proc. IEEE Applied Imagery Pattern Recognition (AIPR), October 2016. 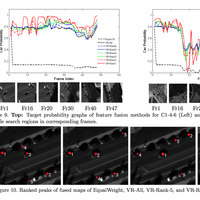 A method for static and moving object detection employing a motion computation method based on spatio-temporal tensor formulation, a foreground and background modeling method, and a multi-cue appearance comparison method. The invention operates in the presence of shadows, illumination changes, dynamic background, and both stopped and removed objects. G. Seetharaman, K. Palaniappan, F. Bunyak, and R. Wang. 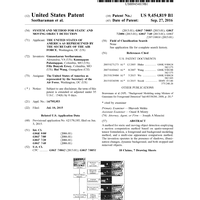 System and method for static and moving object detection. US Patent 9,454,819, September 2016. We consider a multisensor network fusion frame- work for three-dimensional (3D) data registration using inertial planes, the underlying geometric relations, and transformation model uncertainties. We present a comprehensive review of 3D reconstruction methods and registration techniques in terms of the underlying geometric relations and associated uncertainties in the registered images. The 3D data registration and scene reconstruction task using a set of multiview images is an essential goal of structure-from-motion algorithms that still remains challenging for many applications such as surveillance, human motion and behavior modeling, virtual-reality, smart-rooms, healthcare, teleconferencing, games, human-robot interaction, medical imaging, and scene understanding. We propose a framework to incorporate measurement uncertainties in the registered imagery which is a critical issue to ensure robustness of these applications but is often not addressed. In our testbed environment, a network of sensors is used where each physical node consists of a coupled camera and associated inertial sensor (IS)/ inertial measurement unit (IMU). Each camera-IS node can be considered as a hybrid sensor or fusion-based virtual camera. The 3D scene information is registered onto a set of virtual planes defined by the IS. The virtual registrations are based on using the homography calculated from 3D orientation data provided by the IS. The uncertainty associated with each 3D point projected onto the virtual planes is modeled using statistical geometry methods. Experimental results demonstrate the feasibility and effectiveness of the proposed approach for multiview reconstruction with sensor fusion. H. Aliakbarpour, V. B. S. Prasath, K. Palaniappan, G. Seetharaman, and J. Dias. 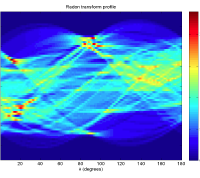 Heterogeneous multi-view information fusion: Review of 3-D reconstruction methods and a new registration with uncertainty modeling. IEEE Access , volume 4, issue 1, pages 8264-8285, September 2016. 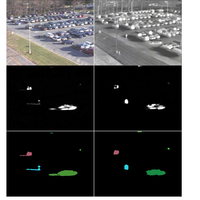 Automatic moving object detection and segmentation is one of the fundamental low-level tasks for many of the urban traffic surveillance applications. We develop an automatic moving vehicle detection system for aerial video based on semantic fusion of trace of the flux tensor and tall structures altitude mask. 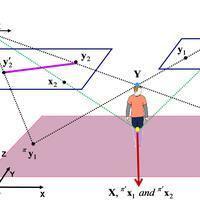 Trace of the flux tensor provides spatio-temporal information of moving edges including undesirable motion of tall structures caused by parallax effects. The parallax induced motions are filtered out by incorporating buildings altitude masks obtained from available dense 3D point clouds. Using a level-set based geodesic active contours framework, the coarse thresholded building depth masks evolved into the actual building boundaries. 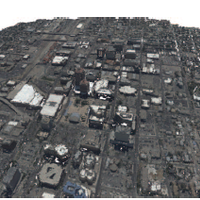 Experiments are carried out on a cropped 2kx2k region of interest for 200 frames from Albuquerque urban aerial imagery. An average precision of 83% and recall of 76% have been reported using an object-level detection performance evaluation method. M. Poostchi, H. Aliakbarpour, R. Viguier, F. Bunyak, K. Palaniappan, and G. Seetharaman. 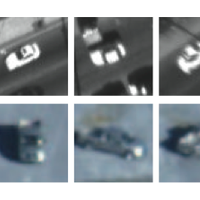 Semantic depth map fusion for moving vehicle detection in aerial video. Proc. IEEE Conference on Computer Vision and Pattern Recognition (CVPR) Workshops, pages 32-40, July 2016. Reducing the amount of user driven input for interactive image segmentation enables faster and more precise foreground extraction of objects. A sparse collection of labeled seed points sampled over image regions can be quickly provided by the user using a few mouse clicks. Seed points are used for training an Elastic Body Spline classifier mapping function. We evaluate the efficiency and accuracy of user defined point inputs compared to fully manual boundary drawing that can be time consuming and automatic image segmentation methods that may not have sufficient accuracy. 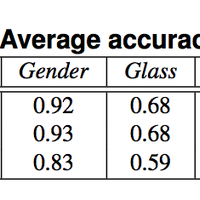 We show that using an average of just 8 labeled pixels (i.e. sparse set of seed points) the proposed EBS foreground-background thresholding method can achieve 90 percent accuracy compared to manual ground truth on the Berkeley BSDS500 benchmark. S. Meena, K. Palaniappan, and G. Seetharaman. 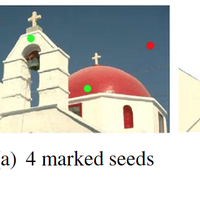 User driven sparse point based image segmentation. IEEE International Conference on Image Processing (ICIP), pages 844-848, 2016. In the event of natural or man-made disasters, providing rapid situational awareness through video/image data collected at salient incident scenes is often critical to first responders. However, computer vision techniques that can process the media-rich and data-intensive content obtained from civilian smartphones or surveillance cameras require large amounts of computational resources or ancillary data sources that may not be available at the geographical location of the incident. In this paper, we propose an incident-supporting visual cloud computing solution by defining a collection, computation and consumption (3C) architecture supporting fog computing at the networkedge close to the collection/consumption sites, which is coupled with cloud offloading to a core computation, utilizing softwaredefined networking (SDN). We evaluate our 3C architecture and algorithms using realistic virtual environment testbeds. We also describe our insights in preparing the cloud provisioning and thin-client desktop fogs to handle the elasticity and user mobility demands in a theater-scale application. In addition, we demonstrate the use of SDN for on-demand compute offload with congestion-avoiding traffic steering to enhance remote user Quality of Experience (QoE) in a regional-scale application. The optimization between fog computing at the network-edge with core cloud computing for managing visual analytics reduces latency, congestion and increases throughput. R. Gargees, B. Morago, R. Pelapur, D. Chemodanov, P. Calyam, Z. Oraibi, Y. Duan, G. Seetharaman, and K. Palaniappan. Incident-supporting visual cloud computing utilizing software-defined networking. IEEE Transactions on Circuits and Systems for Video Technology, 2016. Tracking a target (i.e. 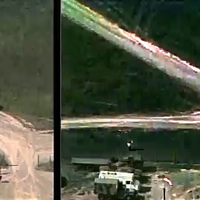 moving vehicle, human being, object, animal) in airborne aerial imagery is a challenging task. Targets are often small in size, target appearance changes with viewpoint including shape distortions, illumination differences and specularities also significantly influence target appearance, targets may be camouflaged, dynamic backgrounds, complex cluttered backgrounds, etc. Occlusions, presence of other moving targets and additional complexities pose further difficulties. This makes fully automatic detection and segmentation of the target a difficult task. Elastic body splines (EBS) belong to the family of splines and have been applied for the task of biomedical image registration. It models the elastic deformation of homogeneous isotropic elastic body subjected to external forces. In this work, we propose to use EBS within an interactive target selection framework which allows the user to select and delineate a complex target by marking only a few pixels. Interactive EBS-based target segmentation is able to perform an accurate segmentation of the target. Our experimental results on wide area motion imagery (WAMI) indicate that the sparse interaction (labeling only 4-6 pixels) by the user leads to good target detection and segmentations in challenging tracking scenarios. keywords = "interactive, segmentation, wami, target selection"
S. Meena, K. Palaniappan, G. Seetharaman, and V. B. S. Prasath. 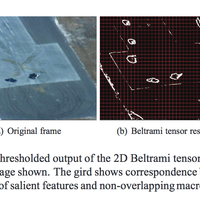 Interactive target selection in aerial imagery using elastic body splines. Proc. SPIE Conf. Geospatial Informatics, Fusion, and Motion Video Analytics VI, 2016. Elastic body splines (EBS) belong to a family of splines introduced for biomedical image registration. EBS models the elastic deformation of a homogeneous isotropic elastic body subjected to external forces. 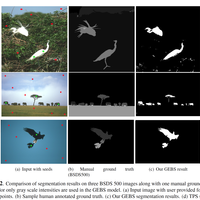 The task of interactive image segmentation is framed as a semi-supervised interpolation where the basis functions are learned using the user provided seed points to model and predict the labels for the unlabeled pixels. Seed points are sparse compared to other methods that may require scribbles and regions. The spline for interpolating labels is the EBS which we compare to our previous work using Gaussian Elastic Body splines (GEBS)  for the task of interactive image segmentation. Experimental results show that the EBS is about 14 percent better, in terms of accuracy, than GEBS and significantly better than random walk and graph cut based segmentation. EBS is also 2.5 times faster than GEBS. S. Meena, K. Palaniappan, and G. Seetharaman. 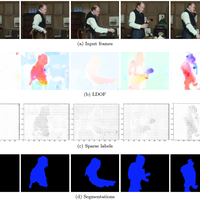 Interactive image segmentation using elastic interpolation. IEEE International Symposium on Multimedia (ISM), pages 307-310 , December 2015. 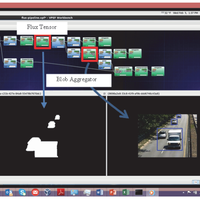 A scalable open systems and standards derived software ecosystem is described for computer vision analytics (CVA) assisted exploitation of full motion video (FMV). The ecosystem, referred to as the Advanced Video Activity Analytics (AVAA), has two instantiations, one for size, weight, and power (SWAP) constrained conditions, and the other for large to massive cloud based configurations. The architecture is designed to meet operational analyst requirements to increase their productivity and accuracy for exploiting FMV using local cluster or scalable cloud-based computing resources. CVAs are encapsulated within a software plug-in architecture and FMV processing pipelines are constructed by combining these plug-ins to accomplish analytical tasks and manage provenance of processing history. 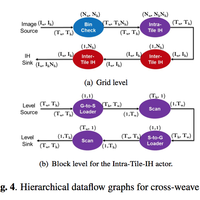 An example pipeline for real-time motion detection and moving object characterization using the flux tensor approach is presented. An example video ingest experiment is described. Quantitative and qualitative methods for human factors engineering (HFE) assessment to evaluate cognitive loads for alternative work flow design choices are discussed. This HFE process is used for validating that an AVAA system instantiation with candidate workflow pipelines meets CVA assisted FMV exploitation operational goals for specific analyst workflows. AVAA offers a new framework for video understanding at scale for large enterprise applications in the government and commercial sectors. W. R. Thissell, R. Czajkowski, F. Schrenk, T. Selway, A. J. Ries, S. Patel, P. L. McDermott, R. Moten, R. Rudnicki, G. Seetharaman, I. Ersoy, and K. Palaniappan. A scalable architecture for operational FMV exploitation (AVAA). Proc. IEEE International Conference on Computer Vision Workshop (ICCVW) Video Summarization for Large-scale Analytics Workshop, December 2015. We present a fast and efficient Structure-from-Motion (SfM) pipeline for refinement of camera parameters and 3D scene reconstruction given initial noisy camera metadata measurements. Examples include aerial Wide Area Motion Imagery (WAMI) which is typically acquired in a circular trajectory and other sequentially ordered multiview stereo imagery like Middlebury , Fountain  or body-worn videos . 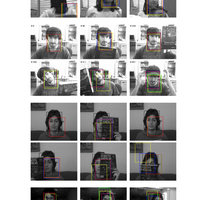 Image frames are assumed (partially) ordered with approximate camera position and orientation information available from (imprecise) IMU and GPS sensors. In the proposed BA4S pipeline the noisy camera parameters or poses are directly used in a fast Bundle Adjustment (BA) optimization. 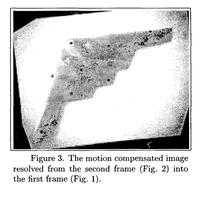 Since the sequential ordering of the cameras is known, consecutive frame-to-frame matching is used to find a set of feature correspondences for the triangulation step of SfM. These putative correspondences are directly used in the BA optimization without any early-stage filtering (i.e. no RANSAC) using a statistical robust error function based on co-visibility, to deal with outliers (mismatches), which significantly speeds up our SfM pipeline by more than 100 times compared to VisualSfM. H. AliAkbarpour, K. Palaniappan, and G. Seetharaman. Fast structure from motion for sequential and wide area motion imagery. Proc. IEEE International Conference on Computer Vision Workshop (ICCVW) Video Summarization for Large-scale Analytics Workshop, December 2015. We present a framework to summarize multiple video streams from unmanned aerial vehicles (UAVs) or drones, which have very different characteristics compared to structured commercial and consumer videos that have been widely analyzed in the past. The goal of this work is to develop scalable exploitation algorithms and tools to increase the utility, retrieval, searchability, dissemination and reuse potential of long duration surveillance videos, by providing quick dynamic geospatial mosaics and motion maps. The proposed method first generates mini-mosaics that can then be combined into geo-referenced meta-mosaics using both sensor and platform metadata associated with the video combined with low-level image analysis. 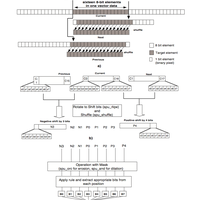 The overall summarization pipeline was tested on several DARPA Video and Image Retrieval and Analysis Tool (VIRAT) datasets to evaluate effectiveness and scalability. R. Viguier, C. C. Lin, H. AliAkbarpour, F. Bunyak, S. Pankanti, G. Seetharaman, and K. Palaniappan. 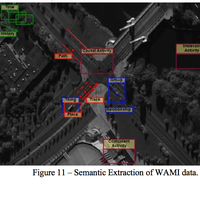 Automatic video content summarization using geospatial mosaics of aerial imagery. IEEE International Symposium on Multimedia (ISM), pages 5pp, December 2015. A robust camera pose refinement approach for sequential wide-area airborne imagery is proposed in this letter. Image frames are sequentially acquired, and with each frame, its corresponding position and orientation are approximately available from airborne platform inertial measurement unit and GPS sensors. In the proposed structure from motion (SfM) approach the available approximation of camera parameters (from low-certainty sensors) is directly used in an optimization stage. The putative matches obtained from the sequential matching paradigm are also directly used in the optimization with no early stage filtering (e.g., no RANSAC). A robust function is proposed and used to deal with outliers (mismatches). The full pipeline has been run over a set of wide-area motion imagery data collected by an airplane flying over different cities in the U.S. The results prove the power and efficiency of the proposed pipeline. Effectiveness of the proposed robust function is compared with some popular robust functions such as Cauchy and Huber using synthetic data. H. Aliakbarpour, K. Palaniappan, and G. Seetharaman. Robust camera pose refinement and rapid SfM for multiview aerial imagery—Without RANSAC. IEEE Geoscience and Remote Sensing Letters, volume 12, issue 11, pages 2203-2207 , November 2015. The importance of the internet-of-things (IOT) is now an established reality. With that backdrop, the phenomenal emergence of cameras/sensors mounted on unmanned aerial, ground and marine vehicles (UAVs, UGVs, UMVs) and body worn cameras is a notable new development. The swarms of cameras and real-time computing thereof are at the heart of new technologies like connected cars, drone-based city-wide surveillance and precision agriculture, etc. Smart computer vision algorithms (with or without dynamic learning) that enable object recognition and tracking, supported by baseline video content summarization or 2D/3D image reconstruction of the scanned environment are at the heart of such new applications. In this article, we summarize our recent innovations in this space. We focus primarily on algorithms and architectural design considerations for video summarization systems. R. Viguier, C. C. Lin, K. Swaminathan, A. Vega, A. Buyuktosunoglu, S. Pankanti, P. Bose, H. Akbarpour, F. Bunyak, K. Palaniappan, and G. Seetharaman. 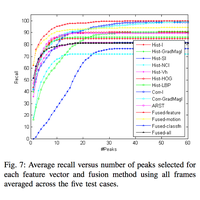 Resilient mobile cognition: Algorithms, innovations, and architectures. IEEE International Conference on  Computer Design (ICCD), pages 4pp, October 2015. 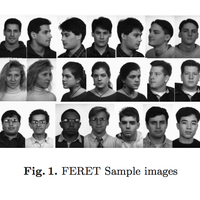 Edge preserving regularization using partial differential equation (PDE) based schemes are now widely used in image restoration. We propose an adaptive multiscale variable exponent-based anisotropic variational PDE scheme that avoids current limitations such as over smoothing and blockiness artifacts while still retaining and enhancing edge structures across scale. The innovative model automatically balances between Tikhonov and total variation (TV) regularization effects using scene content information by adopting a spatially varying edge coherence exponent term constructed from the eigenvalues of the smoothed structure tensor. The multiscale exponent model considered here leads to a novel denoising method which preserves edges and provides selective denoising without generating artifacts for both additive and multiplicative noise models. Mathematical analysis of the proposed method in variable exponent space demonstrates its robustness, and that the approach theoretically satisfies the maximum-minimum principle which guarantees that artificial edge regions are not created. 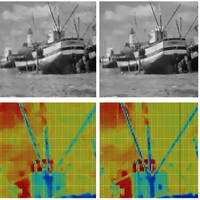 Extensive experimental results on synthetic, natural and biomedical images indicate that the proposed Multiscale Tikhonov-Total Variation (MTTV) and Dynamical MTTV (D-MTTV) schemes perform better than sixteen other denoising algorithms in terms of several metrics including signal-to-noise ratio improvement and structure preservation. Promising extensions to handle multiplicative noise models and multichannel imagery are also provided. V. B. S. Prasath, D. Vorotnikov, R. Pelapur, S. Jose, G. Seetharaman, and K. Palaniappan. Multiscale Tikhonov-total variation image restoration using spatially varying edge coherence exponent. IEEE Transactions on Image Processing, volume 24, issue 12, pages 5220-5235, 2015. This paper addresses the challenging problem of the recognition and classification of textured surfaces given a single instance acquired under unknown pose, scale and illumination conditions. We propose a novel texture descriptor, the Adaptive Median Binary Pattern (AMBP) based on an adaptive analysis window of local patterns. The principal idea of the AMBP is to convert a small local image patch to a binary pattern using adaptive threshold selection that switches between the central pixel value as used in the Local Binary Pattern (LBP) and the median as in Median Binary Pattern (MBP), but within a variable sized analysis window depending on the local microstructure of the texture. The variability of the local adaptive window is included as joint information to increase the discriminative properties. A new multiscale scheme is also proposed in this paper to handle the texture resolution problem. AMBP is evaluated in relation to other recent binary pattern techniques and many other texture analysis methods on three large texture corpora with and without noise added, CUReT, Outex_TC00012 and KTH_TIPS2. Generally, the proposed method performs better than the best state-of-the-art techniques in the noiseless case and significantly outperforms all of them in the presence of impulse noise. A. Hafiane, K. Palaniappan, and G. Seetharaman. 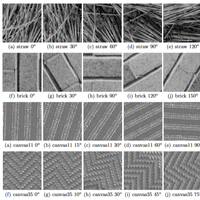 Joint Adaptive Median Binary Patterns for texture classification. Pattern Recognition, volume 48, issue 8, pages 2609-2620, 2015. This paper addresses the challenging problem of recognition and classification of textured surfaces under illumination variation, geometric transformations and noisy sensor measurements. We propose a new texture operator, Adaptive Median Binary Patterns (AMBP) that extends our previous Median Binary Patterns (MBP) texture feature. The principal idea of AMBP is to hash small local image patches into a binary pattern text on by fusing MBP and Local Binary Patterns (LBP) operators combined with using self-adaptive analysis window sizes to better capture invariant microstructure information while providing robustness to noise. The AMBP scheme is shown to be an effective mechanism for non-parametric learning of spatially varying image texture statistics. 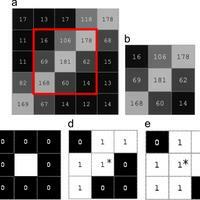 The local distribution of rotation invariant and uniform binary pattern subsets extended with more global joint information are used as the descriptors for robust texture classification. 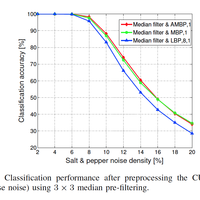 The AMBP is shown to outperform recent binary pattern and filtering-based texture analysis methods on two large texture corpora (CUReT and KTH_TIPS2-b) with and without additive noise. The AMBP method is slightly superior to the best techniques in the noiseless case but significantly outperforms other methods in the presence of impulse noise. A. Hafiane, K. Palaniappan, and G. Seetharaman. 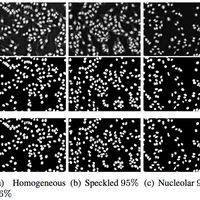 Adaptive median binary patterns for texture classification . Proc. IEEE International Conference on Pattern Recognition (ICPR), August 2014. Elastic body splines (EBS) belonging to the family of 3D splines were recently introduced to capture tissue deformations within a physical model-based approach for non-rigid biomedical image registration. 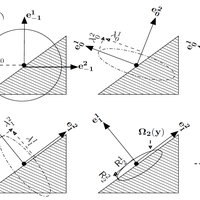 EBS model the displacement of points in a 3D homogeneous isotropic elastic body subject to forces. We propose a novel extension of using elastic body splines for learning driven figure-ground segmentation. 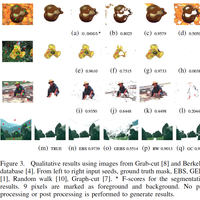 The task of interactive image segmentation, with user provided foreground-background labeled seeds or samples, is formulated as learning an interpolating pixel classification function that is then used to assign labels for all unlabeled pixels in the image. The spline function we chose to model the supervised pixel classifier is the Gaussian elastic body spline (GEBS) which can use sparse scribbles from the user and has a closed form solution enabling a fast on-line implementation. 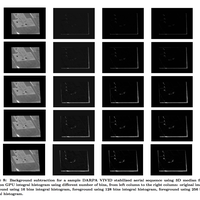 Experimental results demonstrate the applicability of the GEBS approach for image segmentation. The GEBS method for interactive foreground image labeling shows promise and outperforms a previous approach using the thin-plate spline model. S. Meena, V. B. S. Prasath, K. Palaniappan, and G. Seetharaman. Elastic body spline based image segmentation. Proc. 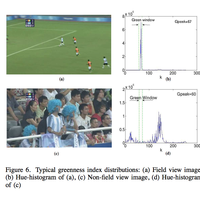 IEEE International Conference on Image Processing (ICIP), pages 4378-4382, 2014. R. Wang, F. Bunyak, G. Seetharaman, and K. Palaniappan. 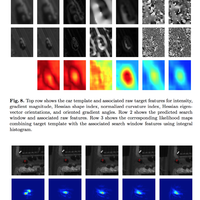 Static and moving object detection using flux tensor with split Gaussian models. Proc. of IEEE CVPR Workshop on Change Detection, 2014. J. Peng, C. Barbu, G. Seetharaman, F. Wei, X. Wu, and K. Palaniappan. ShareBoost: Boosting for multi-view learning with performance guarantees. Lecture Notes in Artificial Intelligence (ECML PKDD), volume 6912, pages 597--612, 2011.